This repair kit turned a set of 25 yr old Acoustic Research AR 8B from old buzzing speakers to new sounding speakers. 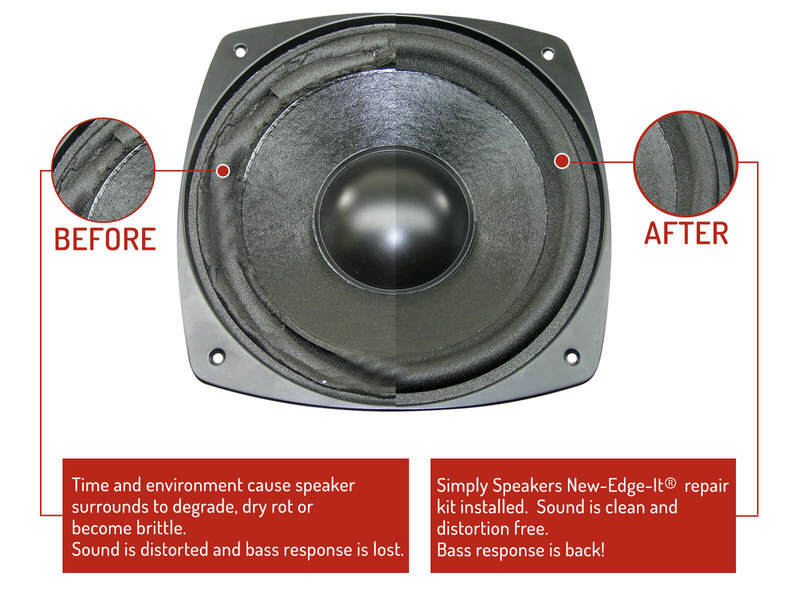 The repair time was only about 1 hour for each speaker and the sound quality has been restored! New life for a pair of Acoustic Research bookshelf speakers. They sound solid. Thanks again. Ordered on-line, prompt delivery to the UK. Took care with the installation and was rewarded with as-good-as-new sounding AR8LS speakers. Very pleased with the results considering I purchased them new around 1983! I previously acquired a SS set for my 1974 AR5 base cones (~four years ago); they're still going strong too. Product worked as promised and now my 20 year old speakers sound like new again. Dont buy new speakers, this works great, easy to install, sounds like new. The foam surrounds on my AR midrange and woofer speakers were just plain crapped out. I went to Simply Speakers to find replacements, because I loved the old cabinets. That's when I found out I could just replace the foam at a fraction of the cost. Quick delivery, three resources for instruction on how to do it and voilá! They sound just like new. It's kinda like painting. A lot of prep but the actual cementing was rather simple and quick. Never re-foamed a speaker before so this was a learning experience. The rings fit my AR-8b woofers perfectly and the instructions were easy to follow. Brought back my speakers from the dead, they sound like brand new. Worked as advertised, hardest part was in prepping the speakers for the new surround.Speakers sound Great again. Q: I have an old set of AR M4 speakers. The foam on woofers is gone. I measured them and believe this is the correct repair kit. The numbers on the back of the speaker are 1210133-A3 and J12TF. Can you please confirm this is the correct kit? A: Yes, this is the correct kit for the AR M4. Q: Are these a good fit for the AR-8Bxi ? A: Yes! This is the correct speaker repair kit for the AR 8Bxi woofers. Q: I have AR 122 Spirit bookshelf speakers. Will this foam kit work for the woofer of these speakers? Do you also sell gaskets which I assume are not included in this kit? Thanks. A: Yes, this is the correct kit for AR Spirit 122 speakers. 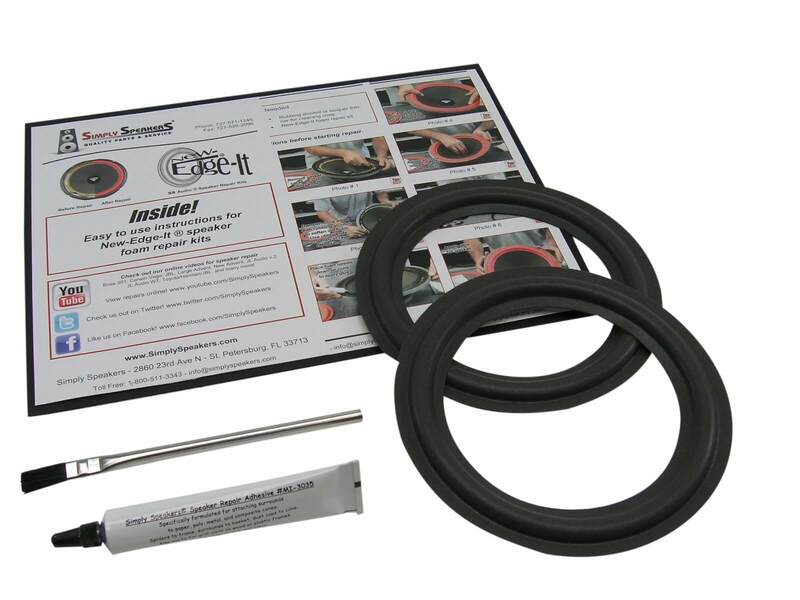 For the gaskets please use the store search for part # GAS-6.5. Q: Is this the correct repair kit for the 8B bookcase speaker? A: Yes, the AR-FSK-6.5 is correct for your model Acoustic Research 8B. Q: I have a pair of Acoustic Research Connoisseur Series AR-19 speakers needing re-foaming. Kit FSK-6.5 appears to be about the right size. Can you confirm this? Thanks. A: Thank you. Yes, this is the correct woofer repair kit for your AR model. Q: Is this the correct kit for AR 18BX speakers? A: Sorry, no. 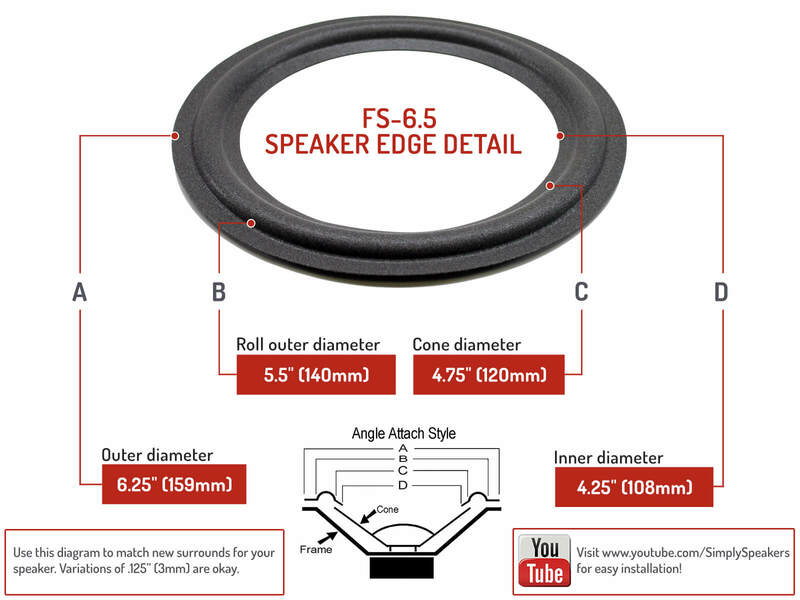 For your model, please order the 8" woofer repair kit part # AR-FSK-8. Thanks! Acoustic Research (AR):, 3pi (2 per cabinet), 3-pi (2 per cabinet), 8B, 8BX, 8LS, 10, 112, 122, 162 (SPIRIT), 1210069, 1210073, 1210074, 1210074-1A, 1210075, 1210078, 1210078-1A, 1210091, 1210158-4, 12100730, 12101301, 12101584, 19B, 35BX, 44BX, 50-T, 55BX, 6BX, 8B, 8BX, 8BXI, 8LS, Connoisseur 40, Connoisseur 50 midrange, 50C midrange, L63, S40, S50, SAT660, SAT 660, SAT-660, Spirit 112, Spirit 122, Spirit 162, STC Subwoofer, TSW-100, TSW100, TSW-110, TSW110, TSW-313, TSW313, TSW-315, TSW315, TSW-410, TSW410, TSW-510, TSW510, TSW-610, TSW610, TSW-710, TSW710, TSW-810, TSW810, TSW-910, TSW910, W-170CP (380045), Red Box I, and many more!